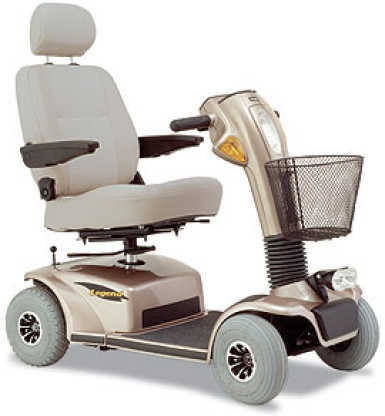 Also known as motorized wheelchairs, powerchairs are run by battery and electric motor. They come with a variety of seating options, can travel long distances and move with just the touch of one hand. They are foldable and conveniently fit into closets, car trunks or vans. Who should use a powerchair? Ideal for wheelchair users with weak upper body strength or those that are unable to maneuver a manual wheelchair. If you have a variety of mobility issues and need a more customized mode of transportation, a powerchair is your best option. Rear-wheel drive: Very stable for outdoor travel or for driving on uneven terrain; powerful suspension systems, high drive speeds and multiple drive control options. Mid-wheel drive: Suitable for indoor use with a responsive, small turning radius; multiple drive control options, good suspension and a variety of seating options. Front-wheel drive: Provides great power and navigation capabilities; smooth ride.